Chances are you’ve seen an unboxing video. People unbox everything from tech to toys, food to fashion. There’s something addictive about watching someone open a new product on camera and experience it for the first time. New is tantalizing. It feels so much better, stronger, prettier, cooler. And my generation can’t get enough. My friends and I have grown up in the Culture of New. We’re wired for perpetual newness—new iPhones, new social media platforms, new entertainment, new styles, new profile pics. Through relentless marketing and subtle societal shifts, we’ve been led to believe that new is always flashier and more fun, and old necessarily implies unreliable and out of touch. No one’s making a video unboxing something they found in Grandma’s attic. We love the thrill of newness. In this mad obsession with new, we’ve grown skeptical of anything old. But we miss a great treasure—in fact, all treasure—when we reject what’s old. Because truth is old. And every human needs a faith rooted in ancient truth. We need regular reminders of how old, unchangeable truth influences our real lives. We need regular reminders of how old, unchangeable truth influences our real lives. Myers—director of the Millis Institute in Brisbane and a research fellow of the Centre for Public and Contextual Theology at Charles Sturt University in Canberra, Australia—firmly believes that this creed applies “equally to old and young, men and women, pastors and church members” (x). He says, “Even today, the creed provides a framework—strong yet surprisingly flexible—for Christian thinking and Christian commitment” (5). The book is beautifully written, with the kind of vivid and stirring language that leads you to deeper reflection and worship. It’s historically rigorous, drawing heavily from church fathers like Gregory of Nyssa, Athanasius, Irenaeus, Augustine, and Tertullian. But it’s eminently readable, making it a compelling resource for all Christians. And it’s simply a joy to read. My two favorite chapters were “Born of the Virgin Mary” and “The Communion of Saints.” Both connected the contemporary church to the bigger vision of God’s story that can’t help but fill you with wonder and excitement. Myers’s love for the universal church is contagious. Lexham Press (2018). 168 pp. $15.99. 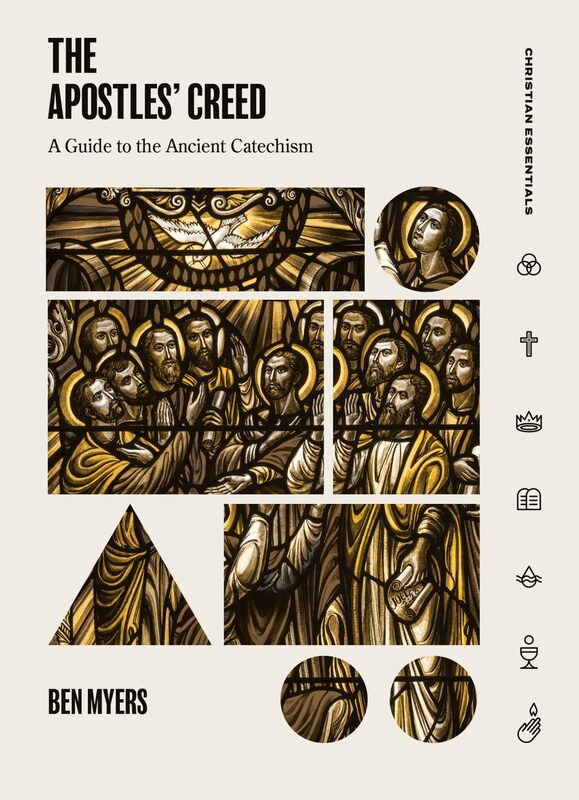 The Apostles’ Creed has united Christians from different times, places, and traditions. It proclaims eternal truths for life today. We believe them, we recite them, but do we build our lives on them? Ben Myers re-introduces that creed. He shows us what about the Christian faith is so counter-cultural, and what truths embedded in the Apostles’ Creed we’ve come to assume, when really they should amaze us and earn our allegiance unto death. This book isn’t an exposition of the Apostles’ Creed. Nor is it a complete theology or apologetic of Christianity, packaged to give to an unbeliever or skeptic. These are meditations for Christians who want to think deeper on their faith. One example is Myers’s chapter on the crucifixion. Instead of focusing on (or even mentioning) sin, his emphasis is on the shame of the cross in an honor-bound culture. For the believer who has a firm grasp on human depravity and the necessity of atonement, this chapter provides thought-provoking insight into another dimension of Jesus’s crucifixion. If taken as an exposition on crucifixion, however, it would be incomplete. Further, some of Myers’s reflections on judgment and the afterlife are fuzzy, and occasionally his lack of fuller expositions results in confusion. For example, when explaining the line “and he will come to judge the living and the dead,” Myers explains that some early Christians believed that heaven and hell are the same place. He quotes from seventh-century monk Isaac the Syrian, who argued that “all people are ultimately brought into the presence of divine love” (92). This sounds uncomfortably universalist, but Myers doesn’t contradict Isaac or identify his error. He simply explains Isaac’s beliefs and then moves on with a “moreover,” leaving the reader puzzled as to what Myers is actually communicating. Despite this regrettable lack of clarity, The Apostles’ Creed is a powerful book for the believer. Many in my generation would look at Myers’s book and still be skeptical of creeds (or books about creeds). “Isn’t Jesus enough?” they might say. Myers knows these objections and provides a series of compelling reasons why every Christian needs ancient creeds. Young Christians feel pressure to conform to the pattern of the world. Our culture is alluring. It’s cool. It tells us to follow our hearts, create our own destiny, and embrace individualism. But the creed points us to the message of the cross—a reality that has always been countercultural. Confessing a creed means we’ll stand out among our generation, but we’ll unite with a multigenerational community across the ages. Myers writes: “To confess the creed is to take up a countercultural stance. . . . We are joining our voices to a great communal voice that calls out across the centuries from every tribe and tongue. We locate ourselves as part of that community that transcends time and place” (10). 2. Creeds protect us from false teaching. The Apostles’ Creed developed partially as a stance against Gnosticism—the belief that physical matter is evil. The creed outlines the basics of the gospel and defends against false gospels. Young Christians still need protection from false teaching, especially since there is really no new false teaching, only ancient heresies repackaged. One heresy that young people often latch on to is universalism. Many young Christians are terribly uncomfortable with hell and prefer an indulgent, tolerant view of God—all mercy, no judgment. Creeds draw us back to ancient truth. They keep us established in orthodoxy and vigilant in discernment. Every generation needs them to guard against their day’s versions of heresy. But creeds draw us back to ancient truth. They keep us established in orthodoxy and vigilant in discernment. Every generation needs them to guard against their day’s versions of heresy. 3. Creeds point us to Jesus. This is Myers’s most passionate point. “We tend to think of creeds as cold didactic summaries of doctrine,” he writes. “But the real centerpiece of the Apostles’ Creed is not a doctrine but a name. . . . Everything else in the creed radiates like the spokes of a wheel from that hub: personal attachment to Jesus; total allegiance to him” (37). Creeds aren’t colorless facts we’re meant to recite and then ignore. They’re life-altering revelations of the God-man, Jesus Christ. They’re truth drawn from his Word, summarized for his people to learn and love. They remove us from a narrow, individualistic mindset and root us in the ancient community of Christians. Ultimately, this is why Myers loves the Apostles’ Creed and could write such a profound book on it: because it points us to Jesus, driving us to worship and delight as we know him more.